Festina Group is one of the world’s leading names in the watch making industry. Its corporate head office is located in Madrid and the logistics centre is based in Barcelona. The company was founded in the 1980’s. It currently produces five different brands of watches for the global market (Festina, Lotus, Candino, Jaguar and Calypso) and two brands of jewellery (Lotus Style and Lotus Silver). Given the different characters of its brands and its many catalogues of collections, the company is sure to cater for the specific needs and tastes of any customer. Its products are designed with a demanding, heterogeneous public in mind, whose sophisticated tastes will appreciate the opportunity to own a finely made watch that is a mark of exclusivity. Festina Group brands are internationally acknowledged and are market leaders in Spain and France, while ranking among the top brands of watches in countries such as Italy, Germany, Belgium and Switzerland. Festina Group enjoys the benefits of its own manufacturing facilities equipped with the very latest technology in Spain, Switzerland, France. It makes its own components and precisión mechanics to safeguard the highest possible standards of quality and the control of production costs so that its products are sure to be marketed at competitive prices. The industrial outlook of Festina Group’s organisation is proof of the Group’s innovative and competitive approach. 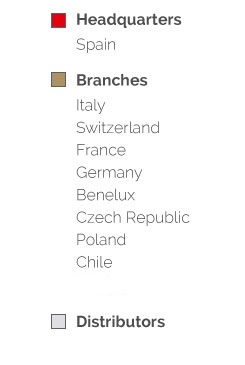 With 7 subsidiaries in France, Switzerland, Benelux, Italy, Germany, Czech Republic-Poland and Chile, Festina Group products are sold in 91 markets across the world by 25.000 points of sale, benefitting from a distribution network that is growing all the time in all five continents. The Group exports mainly throughout Europe, the United States and South America and takes part in the most influential trade fairs for the watch making and jewellery industry every year, including Baselworld (Basel), the JCK Show (Las Vegas), JA (New York) and Inhorgenta (Munich).